If you are planning to wear a bikini, then it is better to trim or shave your bikini areas for a perfect fit. A good bikini trimmer or shaver is every woman’s indispensable grooming tool. A regular trimmer or razor will not give the desired results due to shape and size constraints. Also, as the bikini area is more sensitive, it is easy to cause irritation or rashes. A best bikini trimmer or shaver will give better results for your bikini area than an electric shaver. They are slim, versatile and easy to hold or operate. They also have a high precision head which allows detailed styling suiting your personality and creativity. The shape of the head must get into the curves of bikini line easily to avoid razor bumps and irritations. We review the 5 top rated bikini trimmers and shavers that can give you an enviable bikini line in no time! Schick is one of the top razor brands in the world and the Schick Hydro Silk is an elegant trimmer from their stable, designed for your bikini areas. This is one of the best bikini shaver which has a unique double head design and is very compact. There is a hydrating hydro silk razor on one end and a waterproof trimmer on the other end of the trimmer body. The Schick bikini trimmer features advanced trimming technology to satisfy all your bikini needs. The Schick Hydro Silk TrimStyle razor consists of 5 curve sensing blades that gives you an ultimate close shave and is the best razor for bikini area. 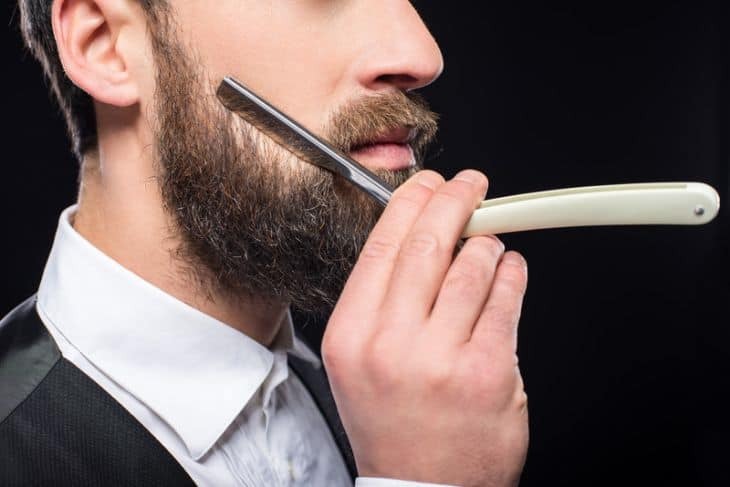 The blades can follow the curves of your body easily and a pivoting action ensures maximum comfort and a clean shave without any nicks or cuts. It also has unique skin guards to reduce skin irritation. They contain water activated hypo-allergenic moisturizing serum that replenishes skin’s moisture up to 2 hours after shaving. On the other end is a waterproof trimmer with a rubber contoured handle for great grip. The trimmer also has an adjustable comb with four customized length settings. You can even use the trimmer alone without the comb to keep the bikini areas trim and clean. The trimmer is powered by a single AAA battery. Replacement cartridges can be bought separately as a pack of 4 razors in one set. One is the normal razor and the other is the sensitive care razor for Hydro Silk. Check this useful video to know more about the Schick Hydro Silk. The Schick bikini trimmer is a handy, inexpensive device that is great for touch ups and one of the best electric bikini shaver. The Panasonic ES246AC bikini trimmer is one of the popular models which provides excellent bikini line trimming and shaping. It is slim and portable and has an angled head that can easily access the bikini areas. Unlike the previous model, this one can only be used for a quick trim and not for shaving.​ It has and adjustable trimmer head whose length settings can be adjusted with a side push button. The trimmer’s rounded head can be adjusted to 5 different lengths to achieve a well-groomed look. The adjustable head can be removed to get an even closer trim but you need to be careful not to cause any nicks. The trimmer is around 1 inch wide which makes it easy to hold and use on your bikini areas. It gives 45 minutes of operation and is powered by 2 AA batteries. The stainless steel blades are hypo-allergenic to prevent any skin irritation. It comes with a cleaning brush too for easy maintenance. The trimmer body is not water-proof so you need to use it in a dry area. You will still have a bit of stubble after trimming that can be removed with a shaver or razor if needed. This small but powerful trimmer is inexpensive and useful for those looking for a quick trim on the go, making it another best bikini shaver. As the name suggests this luxury model from Philips, has all the features needed to make it a best trimmer for bikini area. It can trim, shape and even remove hair to give you a flawless bikini line. It boasts 6 precision attachments that take care of even your eyebrows and has a rechargeable battery that makes it a fabulous trimmer. The surprising feature is an epilation head that can remove hair to give you a silky smooth skin, which is good if you are looking for an epilator option as well. 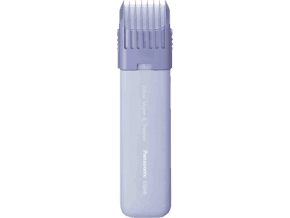 The small epilator head can take care of any remaining stubble or stray hair for a better finish. Precision trimmer head is for fine tuning the bikini line and have a precision comb with 5 length settings. You can use the comb to select the desired trim level from 2 mm to 10 mm. If you need a further closer shave then you can use the micro shaver head with hypo-allergenic foil. You can use the eyebrow comb to trim and a micro trimmer to shape your eyebrows with great precision. It is a wet and dry cordless trimmer which is convenient to carry around and you can use it in shower. It has a rechargeable battery that provides 60 minutes of operation on a 10 hour charge. We wish it had a nose trimmer attachment as well, which if present would have made it an awesome package. There is also a beauty bonus kit containing illuminating tweezers, exfoliation glove and a travel bag. The Bikini Genie is another best trimmer for bikini area from Philips which you can use to trim or shave to keep your bikini line in perfect shape. It is ergonomically designed so you can easily navigate the bikini area avoiding nicks and cuts to get a flawless shave. The rounded bikini trimming head that can trim hair up to 0.5 mm length. There are two click-on precision comb attachments to trim your hair accurately to different lengths from 3 to 5 mm. A mini shaving head is also there that can give you a clean shave after trimming . The Genie is also waterproof so that you can use it shower. The trimmer is powered by one AA battery. A travel pouch and cleaning brush is also included along with the batteries. The Philips Genie is another excellent bikini trimmer that’s safe and easy to trim, shave or style your hair down there. The Schick Quattro is another compact trimmer that offer dual function on the same body similar to the Schick Hydro Silk. One end features a waterproof bikini trimmer and the other end has a pivoting head with four blades so you can transform it for either trimming or shaving. The shaver head has a 4 blade razor with a flexible pivoting head that follows your natural curve for a smooth and comfortable shave. The shaving blades also have conditioning strips with hypo-allergenic ingredients that provide moisture to your skin and prevent any rashes or burns. You can choose the ultra smooth blade or the sensitive blade refills which comes with different conditioning strips. ​The Ultra smooth refill have Acai Berry and Jojoba conditioning strips while the sensitive blades have hypoallergenic serum based strips. The other end features a trimmer head that easy to use anywhere. The vibrating trimmer comes with a trimmer comb that can be adjusted to 3 lengths.​ You can also remove the comb for a fine trim. The curved body has a contoured rubber handle for comfortable grip and balance, allowing you to maneuver the curves on your legs, underarms and bikini area with ease. It is powered by a single AAA battery. 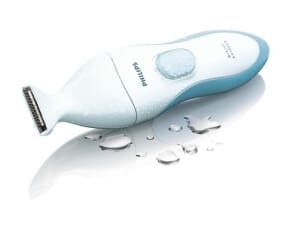 This water proof trimmer is another best razor for bikini area. Now you can get that perfect bikini line easily by choosing the right model based on our bikini trimmer reviews. The Schick Hydro Silk is the best bikini trimmer as it is inexpensive, is a shaver and trimmer and gives great results even for sensitive skin. Most bikini trimmers are affordable, convenient and you can easily style your bikini line. So get one soon and don’t forget to carry your bikini trimmer with you before you hit the beach or a pool.